Esther Ferrer, "Poema de los números primos", Tabakalera, 2019. Tabakalera opens its new exhibition hall with a wide exhibition dedicated to Esther Ferrer (San Sebastián, 1937). The exhibition project, curated by Laurence Rassel and Mar Villaespesa, aims to approach the exhibition hall as an alive space. The exhibition focuses mainly on those works linked to the prime numbers and to the actions and their variations carried out by Ferrer during her wide artistic career. 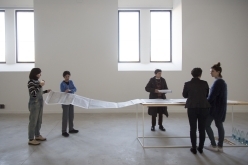 The selection and sequence of works is in accordance with one of the operations that has governed the mechanics of Esther Ferrer’s work throughout her career: “The declension of an idea in different forms [...] the performance and installation have the same DNA, time, space and presence; three fundamental elements but differently declined,” in her own words. And the exhibition is presented as a place for exercises, actions and thought, through which run processes, essays, sketches and models, while at the same time offering an invitation to count, to hear and to feel the materiality of sound, to experiment and to experience the body in motion following different combinatorial possibilities. Numbers, rhythm, sound, language, body, time, space, emptiness ... chance in order, rigour in the absurd, and continuity in variability. 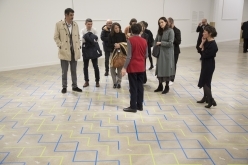 Besides, the exhibition will be accompanied by a weekly performance programme by guest artists invited by Ferrer, and a specific mediation programme. The visitors will be invited to adopt an active rol and interact with Ferrer’s works. Una vez por semana, entre el 12 de abril y el 25 de mayo, 7 artistas y colectivos invitados por Esther Ferrer, presentarán sus acciones o performances en la sala de exposiciones.